Nowhere is the topsy-turvy nature of God's kingdom demonstrated more clearly than in the cross of Christ. Thanks to our Saviour's unflinching commitment to his Father's will, an instrument of agonizing death became the means to eternal life for us all. Yet in this desperately broken world, none of us remain untouched by sorrow and suffering. 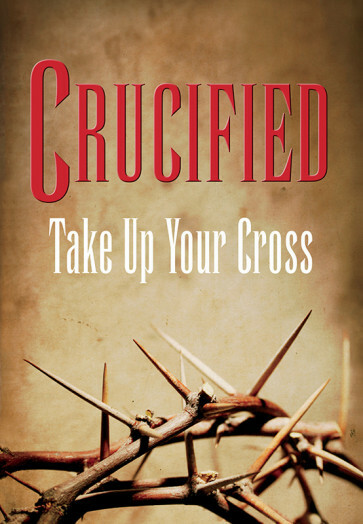 Will we, like Jesus, take up our personal cross and follow him? Crucified: Take Up Your Cross takes you to the Holy Land with Jimmy De Young for an intimate look at the last days of Jesus on his journey to the cross. Visit Bethany, where Mary anointed Jesus' feet with precious oil. Feel the Lord's grief as He wept over Jerusalem. Trace His path from the Last Supper to judgment and the cross . . . and the resurrection. And contemplate how “the fellowship of His suffering” (Philippians 3:10) applies to your own life. With insights from special guests Michael Rydelnik and Joe Stowell, this honest, convicting, and encouraging Day of Discovery DVD will help you embrace life's trials as a means of forming Christ's character in you.